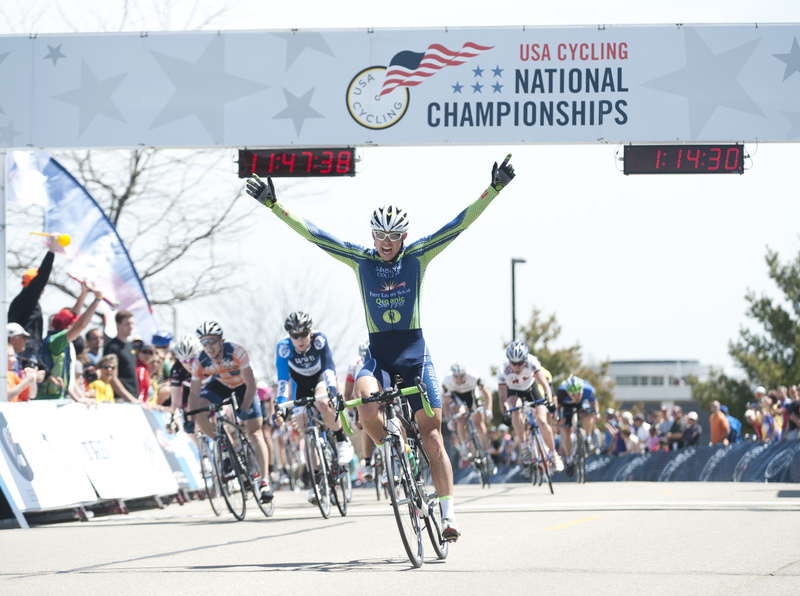 Mars Hill captured its first national championship last weekend at the USA Cycling Collegiate Road National Championships held in Madison, Wisconsin. Along the way, senior Kyle Knott picked up two additional national titles. Knott, of Virginia Beach, Virginia, took first place in Sunday’s criterium, coming off a strong leadout by fellow senior Paul Webb of Omaha, Nebraska. Combined with his strong finish in Friday’s road race, the win placed Knott at the top of the Division 2 individual omnium competition. Strong performances from the rest of the team added to Knott’s performances to give Mars Hill 428 points in the coveted Division II omnium team title race, besting second place Mesa State College with 416, and third place Massachusetts Institute of Technology, with 413. Duke University finished fourth with 211 points, and the United States Military Academy took the final podium spot with 200 points. Though Knott shined, there were several other outstanding performances for Mars Hill which figured in the total team points to claim the team omnium national title. Klara Rossouw of Cape Town, South Africa, finished sixth in the women’s criterium on the way to a twelfth place spot in the individual women’s omnium. Stephanie Bunnett of Naples, Florida, finished 21st in the women’s omnium. Sebastian Scherf of Germany finished ninth in the men’s criterium and seventh in the individual omnium. Paul Webb placed 31st in the men’s omnium and Michael Robinson took 39th place in the criterium. Hugh Moran, Mars Hill College cycling coach, told USA Cycling that he had come to nationals competition hopeful that the Lions could maintain their first-place national ranking and come away with the top podium spot in the team omnium, but after the first two days of competition (which included the team time trials on Saturday), that goal appeared to be almost out of reach.